The cat is back. But this time he has hundreds of companions, all padding softly by his side. Ginger and white and brown and black, their fur slides against each other and their pin prick paws tap the floorboards. I can feel the army march as I lie flat on the wooden ground. I twist my head to see him. There he is, eyes of electric green and angled like almonds: to him, I smile. But you cannot play favourites. The others see and move towards me. I feel the pressure pads as one after another clambers, claw footed, onto my legs and stomach. One, folds of fat wrapped around his gut like rubber rings, thrums with a guttural purr as he settles over my womb and then opens his tiny jaw to yowl. Again. Again. I reach out to them and at first they respond. Triangle noses bash against my fingers and rough tongues flick at my skin. I knot my hands into their fur and stroke them, welcoming them. Green Eyes is stalking up my body. The sea of felines part to let him pass, their heads bowing, but a shiver decends on the room when he touches his nose to mine. Their eyes shrink to slits, and a sound like a burst pipe issues from them. I gasp as I feel their claws elongate, curling under their paws and piercing through my clothes to my skin. The sharp pain as the needle nails draw blood is somehow familiar and dreadful. In panic, I look for Green Eyes, but he has disappeared. He has left his family on me, scratching at the muscular swell of my legs, the soft pillow of stomach, the arches of my breasts, the bones of my shoulder, all the way down my arms to my knuckles. I scream after him but I get no other response than a mimicking screech from the feline army enveloping me, mocking me. The pain now is sharp and constant, like the slow, drawn out sketch of a tattoo. Tears start rolling down my cheeks: I try to breathe, but the inhalation pushes my chest and stomach out so their claws reach deeper. I cannot move, cannot push them away, they will not listen. More are coming. As tails flick in my face and choke me with fur, as blood blossoms from unseen holes and I leak from my skin, I close my eyes. And for a second – just for a second – I stop breathing. You are my feline, whispering stealthily from ear – to head – to heart. Promises you can / cannot keep, wishes you grant / cannot grant; I hear the purrs and grasp your neck between my fingers. You are still. Frozen; you know I have caught you but instead of bending to my will you pretend you are not there. You embody, you become the oxymoron. Fluffy feline and foxy predator. If I hold my breath for long enough you will think I am no longer there. And oh, so wrong you will be. Longing does not exist with lust. Longing is the aftermath of lust, tinted with ‘what ifs‘ and ‘should I’s‘ and ‘maybe’s‘. I long for you. With every breath I wish you closer. And with every breath I wish you gone. Walking home in the dead of night, you visit me. 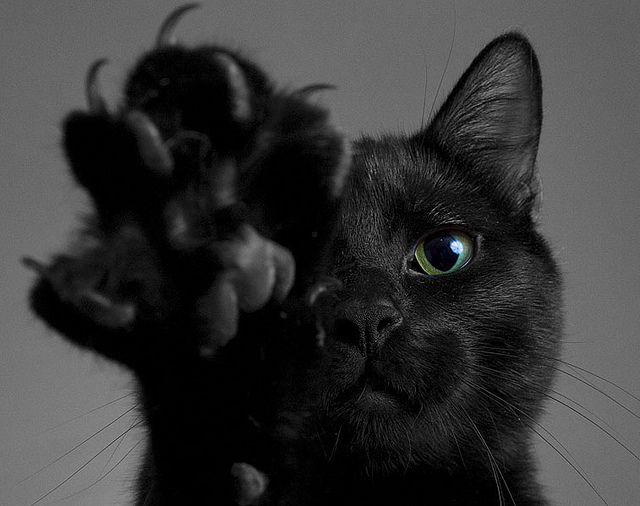 Sleek black coat, claws that click on pavements, sharp eyes that glint. A tail swishes from left to right in the afterglow of an orange street lamp.